I am so excited to have Connie di Marco here at Paranormal and Romantic Suspense Reviews with a Spotlight, Excerpt and Giveaway. 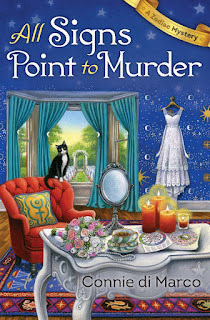 Thanks Connie and Goddess Fish Promotions for allowing me to join your All Signs Point to Murder Blog Tour! Please take it away, Connie! 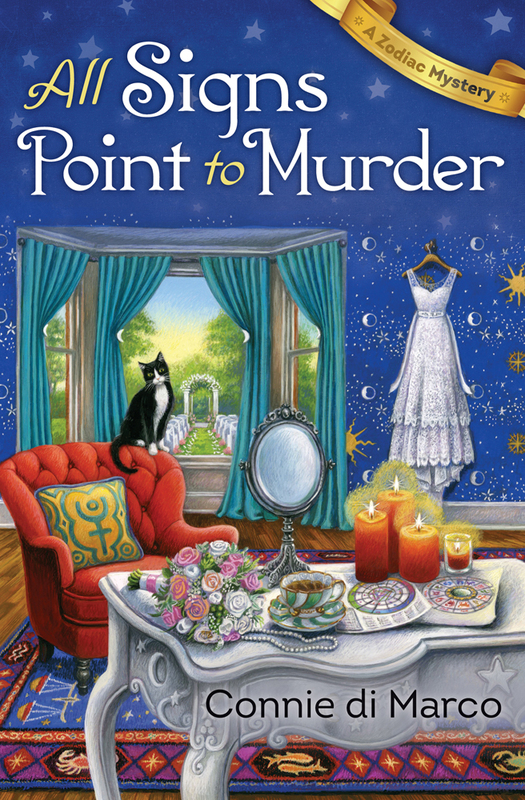 The stars predict a wedding-day disaster, but San Francisco astrologer Julia Bonatti never expected murder. Celia’s house was set back from the wide boulevard on a street that never seemed to be busy with traffic. I pulled up in front and climbed the stairs. After her husband died, Celia was fortunate. She could still afford to live in her home. The front lawn was perfect, a postage stamp of lush brilliant green bordered with hydrangeas. No leaf would dare be out of place in Celia’s garden. I lugged the shopping bag up the stairs, forcing myself not to think about the remnants of Michael’s life that I had packed away. After all, the very least she could do would be to open the door and say thank you. When I reached the top of the stairway, I rang the bell and waited. I waited a few minutes more and then rang the doorbell again. She was home. I was sure of it. She simply refused to have anything to do with me. That old familiar ache rose in my chest. The orphan with her nose pressed against the window looking in on a life she couldn’t hope to have. Angry at my automatic reaction, I rang the bell a third time. Finally, I gave up. Okay, Celia, you win. I placed the bag at the front door and returned down the steps. As I was opening my car door, someone called my name. I turned back. It was Maggie, Michael’s sister. “Julia. Wait.” She rushed down the stairs, out of breath when she reached me. “I’m sorry, I didn’t hear the bell. I was upstairs.” She gave me a warm hug. “Hi Maggie.” I smiled. “It’s great to see you.” I had always liked Michael’s younger sister. I had never known their father, but they both must have taken after him. There certainly was no spiritual resemblance between them and their mother. “How are you?” I responded. Tears sprang to my eyes. I hadn’t expected this greeting and hadn’t thought it would strike such a chord. “Thanks, Maggie. I do appreciate that.” Her eyes were Michael’s eyes, the same green flecks in the brown that gave them a hazel tinge. I glanced up at the front door. Maggie had left it wide open. I spotted Harry, Michael’s dog. When Michael and I first started seeing each other, we went bicycling in the park whenever we could. One day, I spotted something moving under a bush and halted. We investigated and found a beautiful white poodle, half starved, smelling very badly, and suffering from infections. He had obviously been abandoned and someone had beaten him severely. Michael left me to watch over him, and hurried back to retrieve his car. We loaded the bikes on the back and I held Harry on my lap all the way to the emergency vet. Michael paid for all his treatments and then adopted him. His budget as a student was tight, but he didn’t hesitate to help a wounded creature. I think that was when I fell in love with him. Maggie followed my gaze. “Harry! What are you doing?” Harry had knocked over the shopping bag and was sniffing it. When he heard his name called, he raised his head, one of Michael’s gloves in his mouth. He whimpered and looked at us. “Oh, God.” Maggie said. “He knows that’s Michael’s glove. Poor guy. Come here, Harry,” she called. Harry dropped the glove and bounded down the stairs. He came straight at me and leaped towards my face. “He remembers you.” Maggie said. Writing as Connie Archer, she is also the national bestselling author of the Soup Lover’s Mysteries from Penguin Random House (Berkley Prime Crime), set in the village of Snowflake, Vermont. Her recently released A Clue in the Stew is the fifth in this series. Some of her favorite recipes can also be found in The Cozy Cookbook and The Mystery Writers of America Cookbook. Hi Lisa ~ Best of luck in the giveaway and happy reading! Great post - I enjoyed reading the excerpt! Hi Victoria ~ so glad you enjoyed the excerpt. It's hard to choose ones that might be interesting, yet not give away any of the plot. Thanks for stopping by! Hi Bernie ~ Wow ~ that's a tough question. I know I had to read a lot of books, but for the life of me, I can't think of one that sticks in my mind, much less a favorite book! Now, outside of school, I read lots of mysteries and science fiction. Those, I remember, particularly Asimov and Sturgeon books. Best of luck in the giveaway! Thank you, Nikolina! Happy reading and good luck!